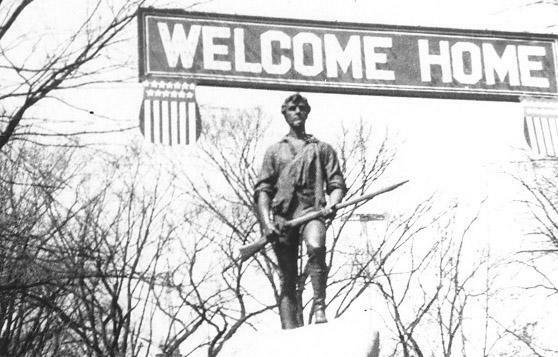 A welcome home sign for World War I soldiers hung over the Minute Man statue a century ago. Throughout her childhood, Shirley Stolz listened to her grandfather reminisce about her uncle, Stanley Hill. While a student at Dartmouth College during World War I, her father’s younger brother enlisted in the American Ambulance Field Service as a driver. 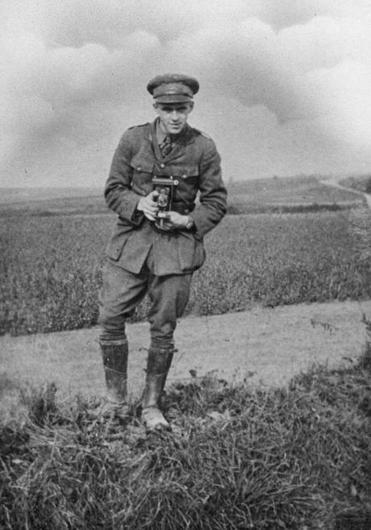 Shot above his left eye in the Second Battle of the Marne in France, Hill would have survived with nothing worse than partial blindness, Stolz recounted, had he not contracted meningitis while recovering from the wound. Hill became Lexington’s first World War I casualty. So when the Lexington Historical Society decided to plan a centennial observance of Armistice Day, which ended World War I on Nov. 11, 1918, it was a fitting choice that Stolz, now 93, was asked to serve as grand marshal in the parade. After all, with the end of the war now 100 years in the past, there are no living veterans of “The Great War” — and not many descendants left who heard firsthand accounts of the battles. The parade that Stolz will lead on Sunday, Nov. 11, is just one of several events on the schedule for this fall. Working in collaboration with the Town Celebrations Committee, Lexington Minute Men, and Lexington Veterans’ Association, the historical society is planning a full season of exhibits, lectures, discussions, and celebrations. Stanley Hill was shot in the face while serving in France, but would have survived had he not contracted meningitis. He died in a French hospital on Aug. 14, 1918. George Gamota of the Lexington Historical Society remembered that his group started contemplating appropriate observances for the centennial about 18 months ago. But just what to do wasn’t clear until Gamota made a trip to the town’s Cary Memorial Hall to inspect the plaque commemorating Lexington’s fallen World War I soldiers, hoping for inspiration. And he found it — when he spied a keyhole below the plaque. No one knew what it concealed, and so a locksmith was recruited. Once the lock was picked and the drawer it held shut opened, Gamota found a parchment scroll that listed all 373 Lexington residents who had fought in World War I. It was a turning point in the historical society’s decision to observe the centennial. 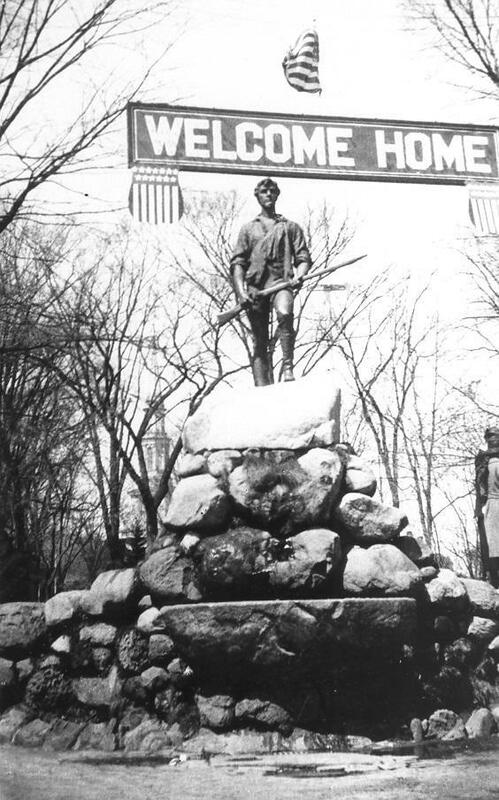 Typically more focused on the town’s hallmark role in the American Revolution, the committee realized then it should start thinking about how to best honor this upcoming milestone. Artifacts that Fraser is assembling for an exhibit to be shown at Cary Memorial Library from Oct. 1 through Nov. 30 include a soldier’s uniform, a Red Cross worker’s uniform, flags, pins, a German railroad car sign, photos from a World War I pilot, and taped interviews with descendants of soldiers. Meanwhile, an exhibit in the plate glass windows of CVS on Massachusetts Avenue will pay tribute to Lexington’s eight fallen World War I soldiers. 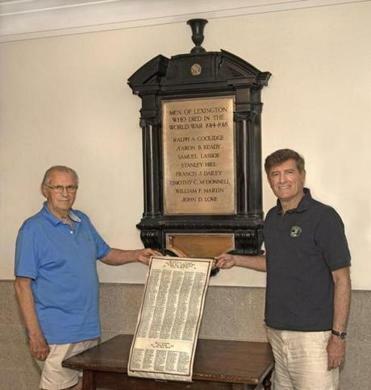 George Gamota (left) and Barry Cunha of the Lexington Historical Society with the scroll they found at Cary Memorial Hall. The lineup of events includes recognition of Lexington’s current population as well as its past residents. When Gamota learned from some of his local Indian-American friends that more than 1 million from India had served the British Commonwealth as soldiers in the war, the Historical Society decided to kick off an evening lecture series at the Lexington Depot with Michele Louro, a professor at Salem State University, discussing India’s role in World War 1. She’ll speak at 7 p.m. on Oct. 4. Subsequent topics to be covered in the lecture series include a look at Edith Nourse Rogers, namesake of Bedford’s VA hospital; the ongoing impact of the war; and a consideration of its relevance in the context of current events. But the events aren’t strictly cerebral. In November, the Lexington Historical Society will host a cabaret-style evening featuring the music and entertainment of World War I; and the Lexington Symphony will devote a performance to the compositions of Joseph Canteloube, a French composer of that era. Stolz, who recently retired after three decades as a Town Meeting member, is happy but not surprised to see her hometown greeting the centennial with fanfare. When the parade kicks off at 1 p.m. on Nov. 11, she’ll be in the lead as grand marshal. For more information about the World War I commemoration events, go to www.lexingtonhistory.org/wwi. 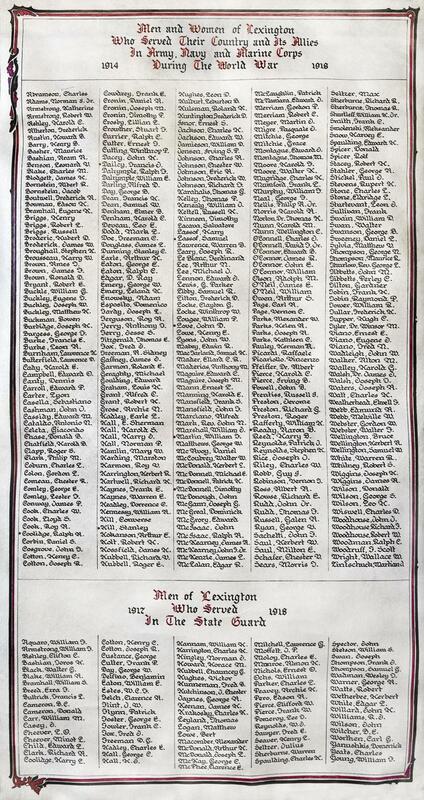 A scroll lists the names of all World War I soldiers from Lexington.